The task of warming up the capacity crowd falls to DRC and ÜR hero Tom Harte, best known as the frontman with the mighty Trucker Diablo and now flying his solo flag, if only for a brief period. 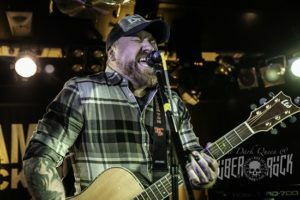 Accompanied, for the first part of the set at least by fellow Trucker Terry on beatbox, he has a few technical issues to sort before declaring that “it’s good to be home” and kicking things off at a lively pace with the energetic ‘Tearin’ Up The Road’. ‘All Night Long’ is slightly mellower and somewhat mournful. Of course, he has to pay a nod to his background, and we get stripped back versions of ‘Drive’ and ‘Voodoo’ before Terry quits the stage to leave his bandmate truly flying solo, which he does by inviting us to catch the ‘Last Train Tonight’ and then asking ‘What About Us?’, both taken from his debut solo EP, ‘Life, Love And Everything In Between’. Tom’s performance is a much more comfortable one than his debut a few months’ earlier, and he is definitely more at ease in the familiar surroundings of the Diamond. Unfortunately, however, it is plagued by the usual problem high pitched harridans squawking all the way through each and every song, and then having the downright cheek to applaud enthusiastically at the end… Nevertheless, DQ is reduced to tears with ‘Where Angels Fly’ and sings along to ‘One More Minute’ before Tom signs off with a cheekily appropriate rendition of the theme from ‘Cheers’: yes, he truly was in a place where (nearly) everyone knows his name. It all threatens to go awry however as, after dedicating ‘Devil Of A Man’ to “my second mam”, who had got married in Las Vegas a little earlier in the evening, he is handed a pint of Guinness: “I haven’t had a drink in 14 days, maybe I better check my medical note to see if I’m allowed this,” he declares cheekily before, egged on by the crowd, he cheekily downs it in one! In between the obvious big pops, such as the always beautiful ‘Mona Lisa Smiles’, ‘Beautiful Curse’, ‘Have A Drink On Me’ (as if we need a second invitation) and ‘Mary Anne’, such shows also offer a chance to air some rare archive material, such as the likes of ‘Whipping Boy’ (“how we originally wrote it”) and ‘Late Night Saturday Call’. 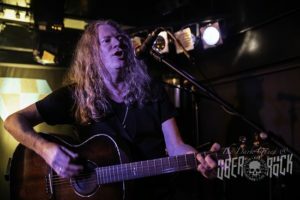 In between, Spike repeatedly invites us to “raise your glasses and help keep rock ‘n’ roll alive”: unfortunately, there are still too many who, despite having paid to allegedly hear the band, are much more interested in doing so with the chit ‘n’ chat. 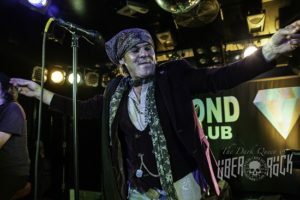 Songs always take on a different texture when they are played acoustically, but tonight proves once again that you don’t need everything plugged in and turned up to 11 – and that The Quireboys are one of the three greatest British rock ‘n’ roll bands of their generation. Until we meet again, lads, keep on doing what you do and we’ll keep on keeping rock ‘n’ roll alive. 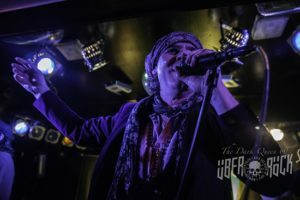 The Quireboys also headline the opening night of the Über Rock-backed SOS Festival in Prestwich on Friday 12 July and final night of the Rock & Bike Fest in South Normanton on Saturday 13 July. PHOTO CREDIT: All photos © The Dark Queen/Über Rock. You can view our full gallery of photographs HERE.